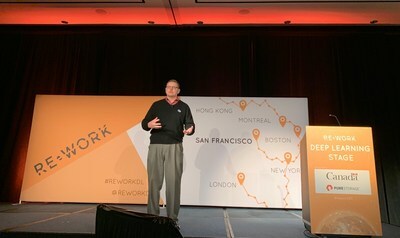 SAN FRANCISCO, April 2, 2019 /PRNewswire/ -- Dr. Edgar Kalns, the leading research scientist of Squirrel AI Learning by Yixue Group-Stanford Research Institute (SRI) Joint Laboratory of AI Learning, was recently invited to speak at international top AI deep learning summit RE-WORK Deep Learning Summit in San Francisco. Alongside other renowned thinkers and researches in deep learning, Kalns spoke about Squirrel AI Learning's research and goals in the future. Dr. Edgar Kalns, a research scientist of AI+education unicorn Squirrel AI Learning, is giving a detailed description of Squirrel AI Learning's technical innovation to the audience. As a research scientist from AI+ education unicorn Squirrel AI Learning, Dr. Kalns explained to the audience Squirrel AI Learning aimed to improve the "learning efficiency by five times" to make individualized education a reality. He displayed the results of the four man-machine wars achieved by Squirrel AI Learning, suggesting that machine teaching achieved a better effect than expert teachers. 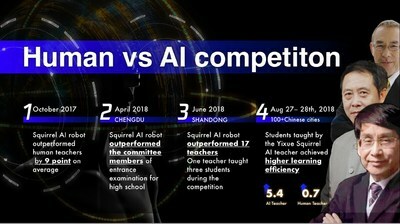 Based on its core scientist team's top-level R&D strength, as well as technological innovation and breakthroughs, Squirrel AI Learning started holding four "man-machine competitions" in Zhengzhou, Chengdu and Dongying in October 2017 in a bid to identify any difference between its adaptive learning system and human teaching. Dr. Kalns demonstrated to the RE-WORK audience the results of the four competitions: surprisingly, machine teaching outperformed human teaching in all the four competitions. Taking the fourth competition, which unfolded in one hundred cities, as an example, students at the same intellectual level were divided into two groups and received human teaching and Squirrel AI Learning respectively. Every student in the machine teaching group learned 42 knowledge points on the average, while every student in the human teaching learned 28 knowledge points on the average; in terms of average scoring in the core part of the competition, the students in the AI teaching group had their scores increased by 5.4 on the average, while the students in the human teaching group just had their scores increased by 0.7 on the average, suggesting that machine teaching enabled students to take a firmer grasp of knowledge points than human teaching and improved the learning efficiency more significantly than human teaching. According to the results, Squirrel AI Learning is basically the same as or better than individualized human teaching. Dr. Kalns also gave a technical presentation of how Squirrel AI Learning and SRI applied the AI technology and machine learning application program to adaptive education, as well as of the theoretical basis, technical method and research results of MILBA and VPA projects. The advanced technical method and creative application, as well as successful implementation in the commercial field, drew high attention from the participants, many of whom showed their keen interest in Squirrel AI Learning's technological innovation, product implementation and future development, and expressed their expectation of cooperating with Squirrel AI Learning. Then, Dr. Edgar Kalns detailed how Squirrel AI Learning uses the Virtual Personal Assistant (VPA) to interact with students in natural language for a real-time understanding of their learning progress and timely individualized intervention in teaching schedule so that the adaptive teaching system could improve students' learning efficiency. Moreover, Squirrel AI Learning makes a multi-modal behavior analysis (MIBA) to monitor and analyze students' facial expressions and behaviors. That is, the Squirrel AI Learning system can track students' line of sight to judge whether they are looking at the computer screen; measure their body movements, including the motionlessness of the head and sight, to evaluate their attentiveness; and detect and analyze their learning emotion to accurately judge their learning status to help teachers identify real problems and therefore carry out individualized education. Squirrel AI Learning has established a joint laboratory of AI with the SRI International, Chinese Academy of Sciences and CMU respectively. Its scientific research theses have been included in international top academic conferences, such as CSEDU, AIED and AERA, and its staff has been invited as a keynote speaker to many top summits such as IEEE, ACM, IJCAI, AAAI and KDD. Moreover, Squirrel AI Learning has won many international awards, including the EdTechXEurope Growth Award and the 2018 Greatest Social Contribution Award for AI, cementing its leading position in the AI+education field. Dr. Edgar Kalns also displayed Squirrel AI Learning's market results at the Summit. Since 2016, Squirrel AI Learning has set up more than 1,800 offline learning centers in over 20 provinces in China. So far, Squirrel AI Learning has offered services to more than 1 million students, about 80% of whom continue taking the courses. The 2015-2018 annual compound growth rate is 600%, ranking 12th among the Deloitte Technology Fast 50. By July 2018, Squirrel AI Learning had raised funds of over USD 1 billion with the corporate valuation approaching USD 1.1 billion, becoming a unicorn. At the Summit, core scientists from high-tech behemoths, such as Google, Coursera, OpenAI, NVIDIA, Facebook, Netflix, Uber, Twitter and UC Berkeley, and professors from famous universities also made exchanges and discussions on various topics, including social welfare and commercial application of AI. Prof. Daphne Koller, a co-founder and Co-chair of Coursera and a professor at the Stanford University, had a discussion with Rumman Chowdhury, senior manager of Accenture, on the progress of AI technology, the application of AI in the medical field and the possibility of replacing doctors with AI. Prof. Daphne Koller believed that with increasingly excellent performance in well-defined pattern recognition tasks, the computer can solve any problem that couldn't be solved before. However, for realistic AI, she thought that there is still a gap. Ian Goodfellow, a scientist of Google Brain and the inventor of GANs, explicated the idea of GANs, which are based on a two-person zero-sum game: one is a generative network that creates pictures, while the other, a discriminant network, judges whether the pictures come from training data or from the generative network. He said, "This mechanism is similar to the contradiction between a counterfeiter and an anti-counterfeiter. The counterfeiter needs to convince the counterfeiter of the authenticity of the fake product made by him." Chief architect of Slack Keith Adams explained the application of AI in an autonomous car and how AI could be used to produce a positive effect, and gave his own views whether AI could replace manpower. He thought that there would already be a new tool as a substitute for C ++ long before truckers were replaced. He said that the autonomous car was on the far end of AI, adding humorously, "If the car runs in India, it needs to know many things about Indian roads, e.g., the way an elephant 'walks' on a highway!" Founded in 2014, Squirrel AI Learning is a leading Chinese AI+education provider, has the Asia-Pacific region's first complete proprietary intellectual property and an advanced algorithm-focused AI engine, and devotes itself to providing every child with better individualized education. Upon its establishment, Squirrel AI Learning formed a core R&D scientist team of members from global AI education unicorns such as Knewton, RealizeIT and ALEKS. Of the members, Richard Tong, the chief architect of Squirrel AI Learning and Managing Director in the North America region, is the technical leader at Knewton, the first AI education provider to be founded in the USA. In the Asian-Pacific region; the chief scientist Dr. Cui Wei has a postdoctoral degree in AI obtained from the National University of Ireland, and used to be a core scientist of RealizeIT. The chief data scientist Dr. Dan Bindman is a co-founder of U.S. AI adaptive education magnate ALEKS, and the chief architect responsible for core product algorithm. At the global AI+ adaptive education summit AIAED held in Beijing in November 2018, Prof. Tom Mitchell, the global luminary on machine learning, Dean of School of Computer Science (CMU), Carnegie Mellon University, a fellow at the National Academy of Engineering and American Academy of Arts and Sciences, and a fellow at the American Association for the Advancement of Science (AAAS) and American Association for Artificial Intelligence (AAAI), announced his acceptance of the invitation from Squirrel AI Learning to serve as the Chief AI Officer.